‘Tis the season to warm up with a mug of hot chocolate – we like to mix up a big batch of our own, rather than rely on packaged instant hot chocolate, to stir into warmed milk throughout the winter. It’s also an easy thing for kids to measure and stir together – no chopping or heat required – to package up and give to their friends, relatives, even teachers and coaches to say thanks during the festive season. All you need is some good cocoa, powdered sugar (which will dissolve more easily than regular sugar) and a handful of mini marshmallows. Set the kids up with some markers to make labels, and your holiday gift giving is halfway done! In a large bowl, whisk together the powdered milk, cocoa, brown sugar and salt until no lumps remain. 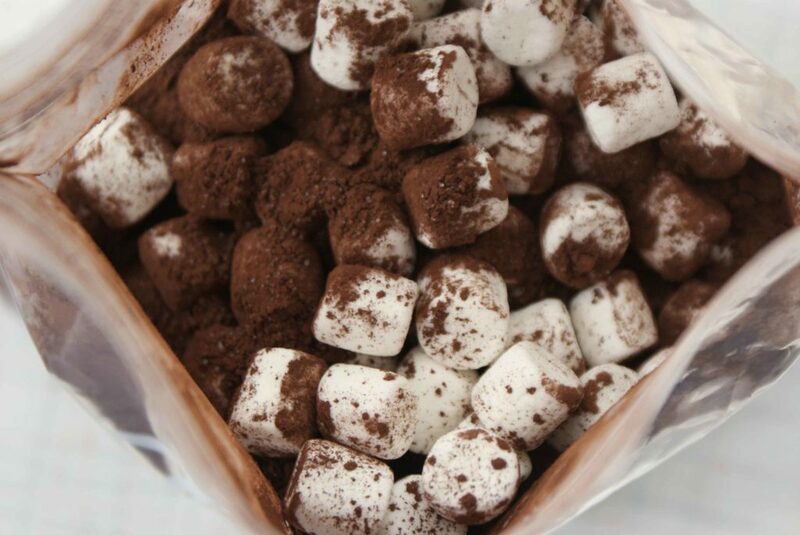 If you like, add mini marshmallows. Store in a Ziploc bag or airtight jar. To serve, stir 1 cup boiling water into 1/4 cup hot chocolate mix (or to taste). Posted in Recipes, Book Recipe A-O, Beverages.